A quick search of the word “pogonip” on Twitter will pull up a long list of tweets asking what the word even means, in response to a guide to each state’s unofficial state word. But according to an interactive map posted by Slate, Nevada’s unofficial state word is pogonip, according to linguistics research focused on slang words. Don’t know what pogonip is? It’s okay, it’s a Northern Nevada thing. Slate defines it as “a dense, icy fog,” while a Google image search pulls up a more specific look than what you would imagine that to be. Some more recognizable slang terms listed include California’s “hella,” a word used frequently among Nevada residents, and Massachusetts’ “wicked,” a known multi-use word in the small state’s vernacular. Some others you may not know are “Glawackus” from Connecticut, the name of a beast of local legend, and “kybo” in Iowa, which means Porta Potty, according to Slate. Our neighbors to the southeast in Arizona are given “snowbird,” meaning a person who visits the state to escape winter somewhere else. In an attempt to define Nevada in another way, our Facebook fans nearly unanimously suggested “hella,” which … you know, is California’s. Another suggestion was “dusty,” which can refer to the state of the city’s surroundings, as well as meaning “unkempt or ugly,” according to Urban Dictionary. Does Nevada have any of its own slang? 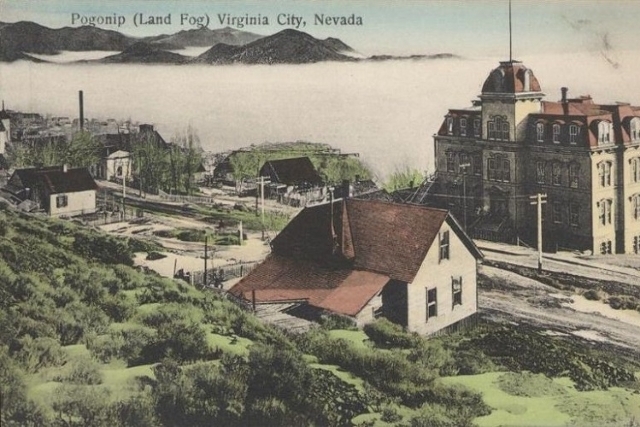 Do people actually say pogonip in Northern Nevada? Has anyone in Las Vegas heard this term? Check out the rest in the map below or click here to access a larger interactive map.